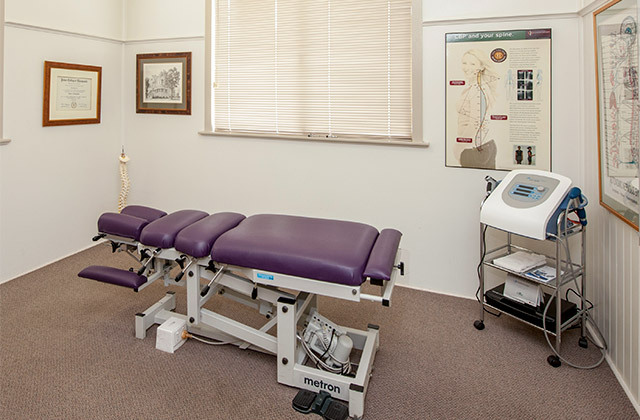 Toowoomba Chiropractic Centre’s chiropractic consulting room. Once you have phoned, our helpful staff will make an appointment time which best suits you. When you arrive at our office you will be greeted in a friendly manner and we will make you feel welcome. You will be asked to complete a case history form. This helps us capture valuable information about what has brought you to us and your known pre-existing health conditions. The purpose of your first visit with Dr Rock is to discuss what troubles you and to see if chiropractic care can help you. If it looks promising that Dr Rock can help, a thorough examination will help identify the cause of your problem. Where X-rays are clinically necessary we will refer you to a local X-ray clinic where they are usually bulk billed. Depending on your condition, you may be treated on your first visit or we may need to wait for results from the X-rays. If you have previous X-rays, MRI or CT scans please bring them with you on your first visit. Patients appreciate that we are thorough and explain everything in advance. It must be said that no profession helps all conditions. Dr Rock listens carefully and examines thoroughly and if it seems your condition would be helped by another health professional, you will be referred on to them. Your second visit is what we call your report of findings visit. During this appointment, Dr Rock will explain what the problem is, advise what treatments options are available to you (including non-chiropractic alternatives) and their likely risks and outcomes. With a complete study of your health history correlated with examination findings, Dr Rock will recommend the best approach to improve your condition. Depending on your unique situation, Dr Rock will apply his professional judgment in offering you a tailored treatment plan that respects your goals and choices for the best outcome. The first and second visits are about 30 minutes each in length. Patients are occasionally concerned that the regular visits will be as lengthy as the initial two visits. This is not so. Once the important ground work is complete the regular visits require only a few minutes. Assessing the current condition of your spine and nerves, making specific adjustments and getting you on your way doesn't take long. Each visit builds on the previous visit and missing a treatment may delay your health outcomes. We understand that most people have a busy life and time is valuable. That’s why we work with you to make appointments that are best suited to your life, so you can get the chiropractic treatment you need and get on with your busy life. We do our best to run our clinic on time and our goal is to see you within 5 minutes of your appointment time 90% of the time. If you have a chiropractic related question, please submit it to the Toowoomba Chiropractic Centre via our contact us page.